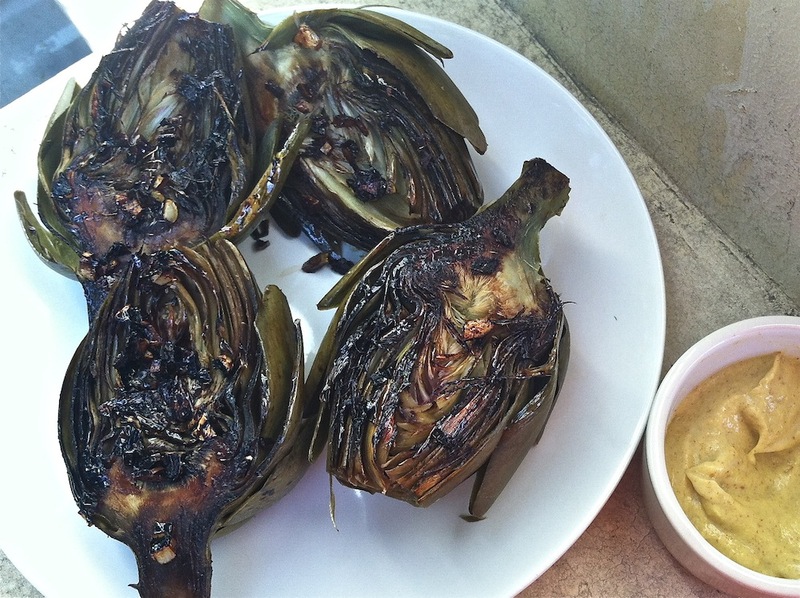 Pan-Seared Balsamic Artichokes | Keep It Up, David! Artichokes are one of those vegetables that just seem like a hassle. Artichoke hearts are delicious – I buy them in cans or jars a lot – but getting a heart out of an actual fresh artichoke takes roughly 23 steps, and it’s a mess. Similarly, cooking fresh artichokes takes forever, and the payoff, while delicious, is small. Most of an artichoke is inedible. Despite all this, when a friend gave me two artichokes so they wouldn’t go bad when he went out of town, I got excited. I haven’t had a whole fresh artichoke in years, and they’re tasty. When I first moved to Burbank about a decade ago, I got into a weekly habit of walking to the nearby farmers’ market, buying a fresh artichoke or two, boiling the crap out of them, and eating them with lots of butter and mayonnaise. My artichoke phase lasted a month or two, and I haven’t cooked a whole artichoke since. When I got my hands on these artichokes, I was curious if there was alternate cooking method besides boiling, which is just so… boring. I came across a couple recipes for pan-seared artichokes, and decided that was the way to go. I read a bunch of recipes, and then took bits and pieces from a few of them to come up the method I’m going to describe right now. 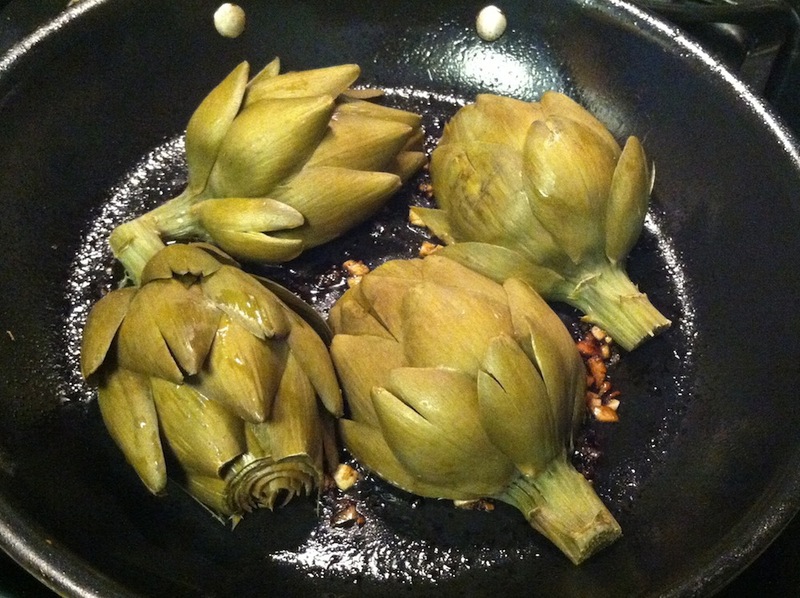 Ready for my Pan-Seared Balsamic Artichokes? Spoiler Alert: This recipe calls for no added butter or oil whatsoever! 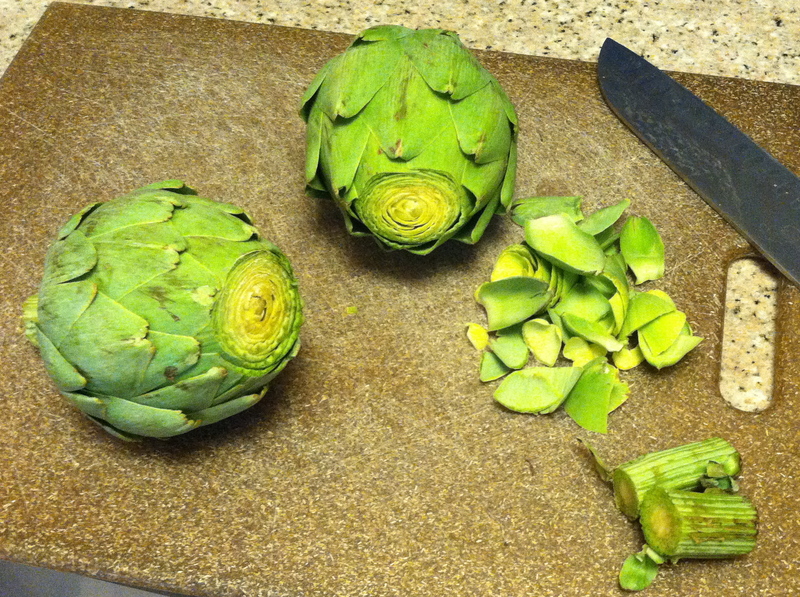 First off, cut the stems, leaving only an inch or two attached to the artichoke. 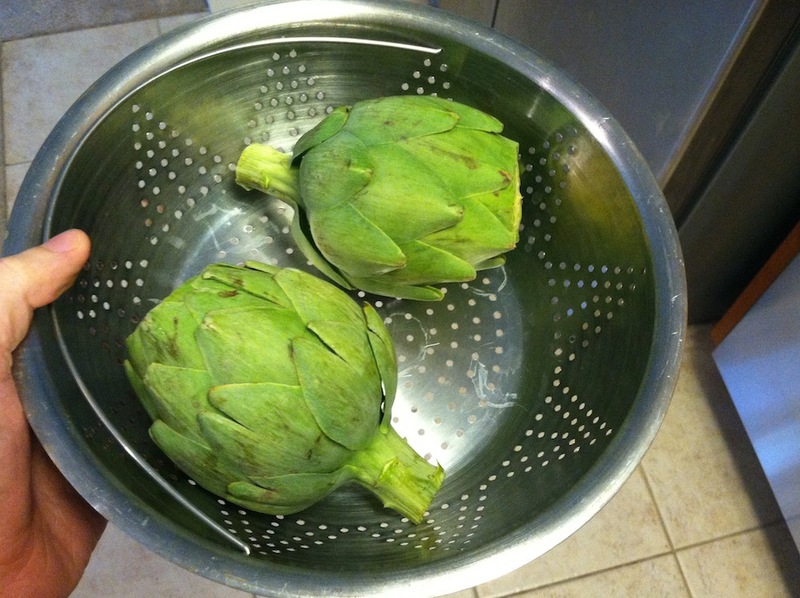 Then, cut off the very top of the artichoke – as seen in the first photo above. I’m not actually sure why you do this, but a bunch of the recipes I read recommend it, so I did it. Even though you’re going to pan sear the artichokes, you need to cook them more thoroughly first. You only finish them in the pan. I decided to steam them, basically because they both fit perfectly in my steamer basket. Everywhere I read said that steaming artichokes takes 30-45 minutes, but mine were on the smaller side, so 30 minutes was plenty of time. Once I put the basket over the simmering water, I squeezed a couple lemons over the cut side of the artichokes, so they wouldn’t oxidize, and threw the lemon halves in the water, just because. Sidebar: If you have larger artichokes, you may want to peel off the outermost layer of leaves and/or peel the stem with a vegetable peeler, according to the interwebs. 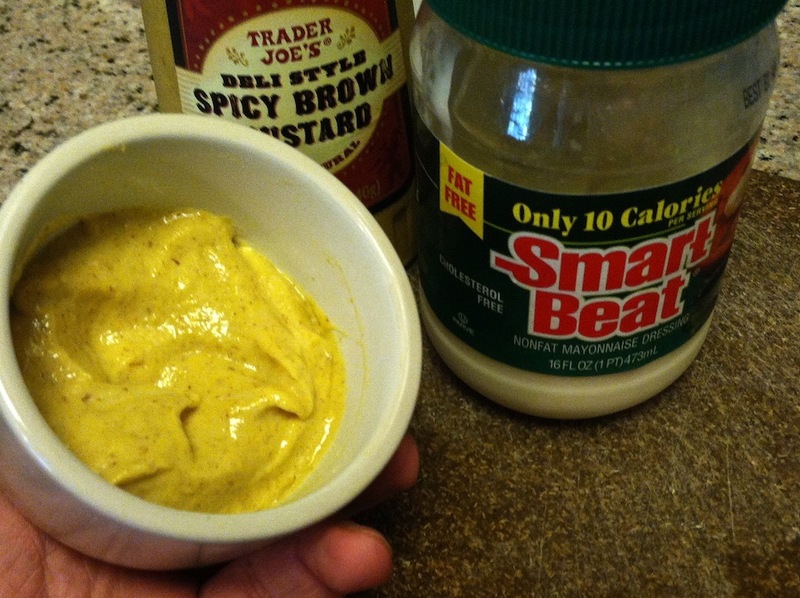 I also took another minute and made a quick dipping sauce: equal parts spicy brown mustard and Smart Beat, a low-cal, non-fat mayo alternative. I made 2-3 tablespoons of dipping sauce, and it’s fat-free and has about 25 calories total. 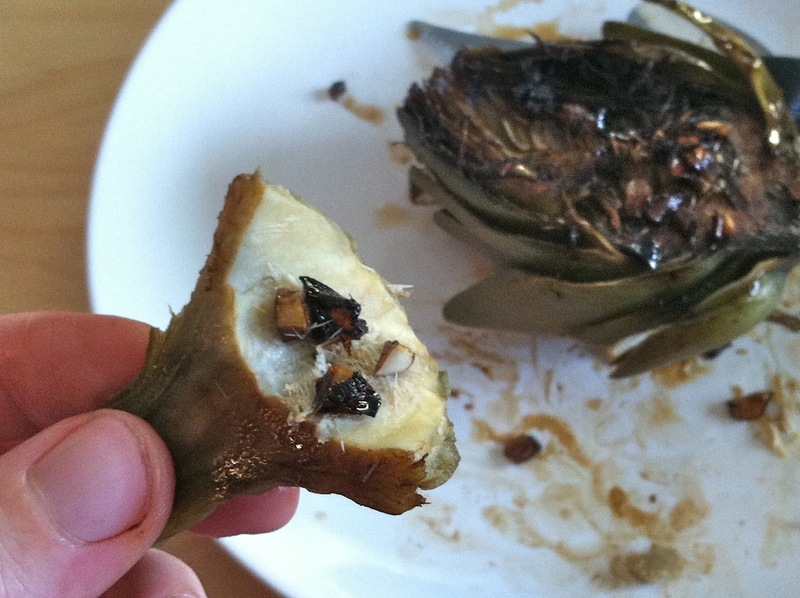 The artichokes are done when you can easily pierce the base of one with a paring knife. Remove them from the heat and let them sit a few minutes to cool, so you can handle them. So. Amazingly. Delicious. 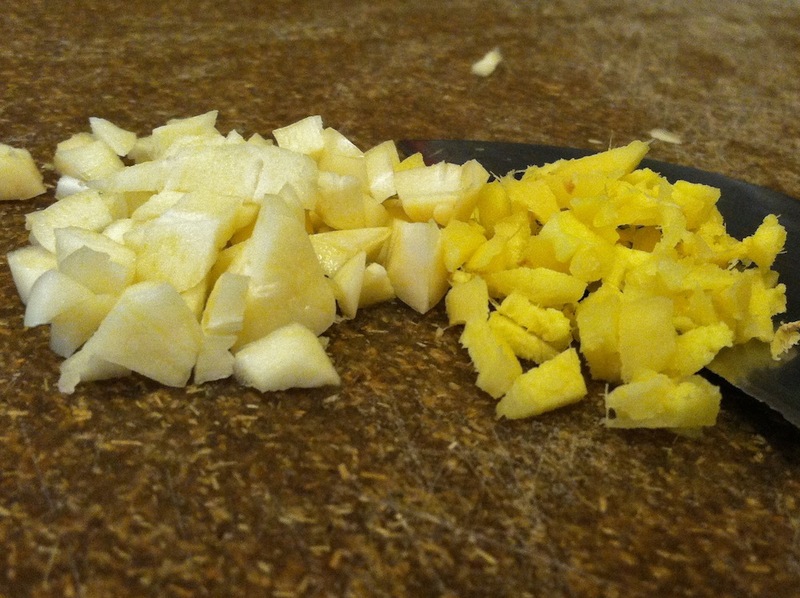 Be sure to spoon the garlic and ginger left in the skillet over the top of your artichoke halves. 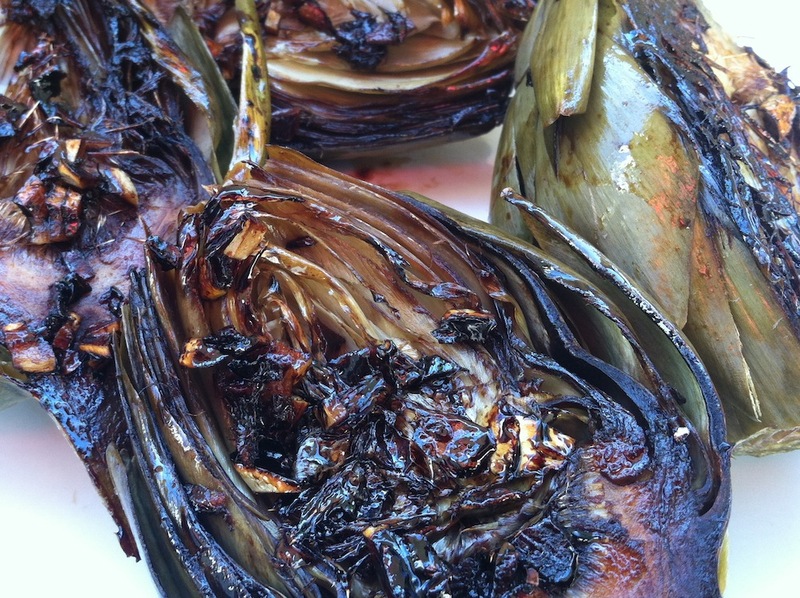 The artichokes are tender, and you can scrape off the edible part of each petal so easily with your teeth, while getting some sweetness and acid from the balsamic. The dipping sauce adds a little creaminess, but you don’t need much! After you peel off all the petals, have a sharp knife handy to remove the fuzzy part in the center. Once that’s gone, you’re left with the heart – the best part! I added a few bits of garlic and ginger and dug in. Remember that the heart extends down the stem, so don’t cut the stem all the way off at the beginning! I ate all four artichoke halves in one sitting. Fresh artichokes are a good source of fiber, folic acid and vitamin C, and have a compound that’s been shown to help reduce cholesterol. 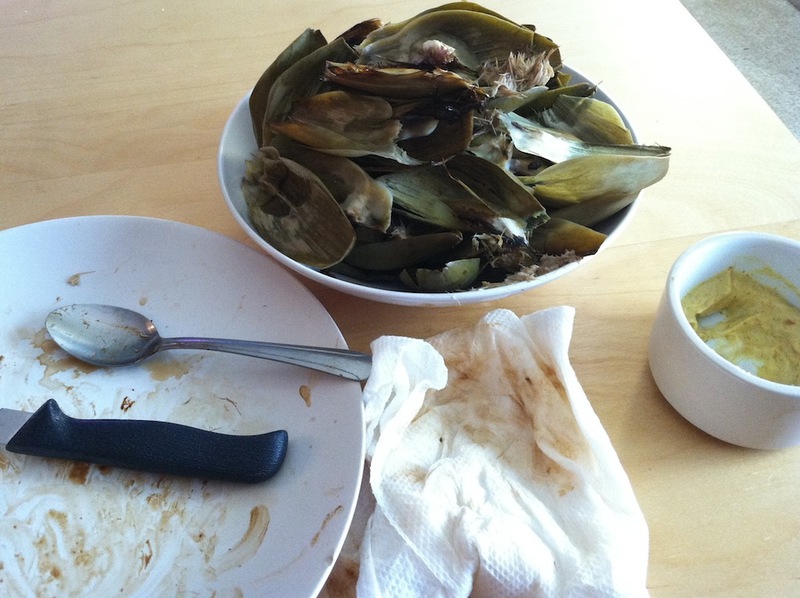 One last tip: have a bowl handy while you eat them, because like I said in the beginning, there’s a lot of waste, and eating artichokes can be messy! This entry was posted on Monday, February 24th, 2014 at 12:04 am and is filed under Uncategorized. You can follow any responses to this entry through the RSS 2.0 feed. You can leave a response, or trackback from your own site. I’m wondering how that would taste with other vegetables. You know, instead of a bag of chips while watching House of Cards? Sure would like to look like Claire! Thanks! I can’t think of a vegetable that wouldn’t taste good pan-seared with balsamic. Can you? That’s awesome and so much better than buying artichoke hearts in a jar. I’ve always wondered how to cook and eat a fresh artichoke. May have to try this this weekend. Thanks for stopping by… ME TOO!